Most of us are active internet and social media users, but do we realize how much of our personal data is collected and stored? Googleing your name was once a good indicator of what can be found on the web about us, but there is much more. According to Business Insider, social media channels such as Facebook, have a few ways of figuring you out. First, you have disclosed some valuable information such as your name, age, marital status, parental status, location, work, education, etc. Second, what you do on Facebook including posts, likes, groups joined, photos and links shared, and things you click on is all tracked and analyzed. Third, visiting websites outside of Facebook is also tracked. Facebook reads the cookies placed by other sites to serve up ads and other websites. 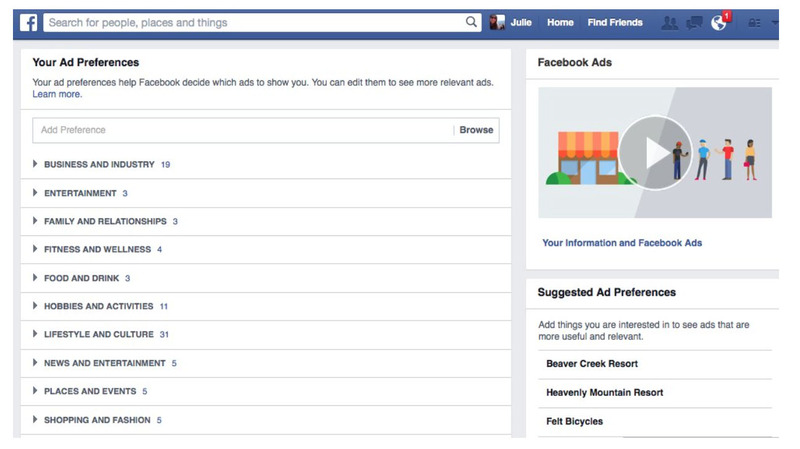 To get an idea of what Facebook thinks you like, you need to find a tool called Ad Preferences. If you select Manage Your Ad Preferences, Facebook will provide a list of categories based on things you have liked such as business, entertainment, family, fitness, food and drink, hobbies, news, places, shopping and fashion, etc. You can select these categories to drop down to more specific topics and tell Facebook that you are not interested in these topics. 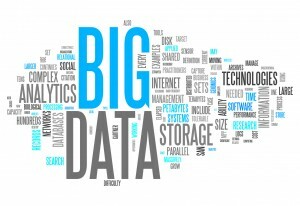 CNN’s article on Big Data, takes a deeper look at Acxiom, one of the country’s largest data brokers. Axciom claims to have information in 190 million customers. They collect everything from education level, political leanings, to ethnicity, and income level. 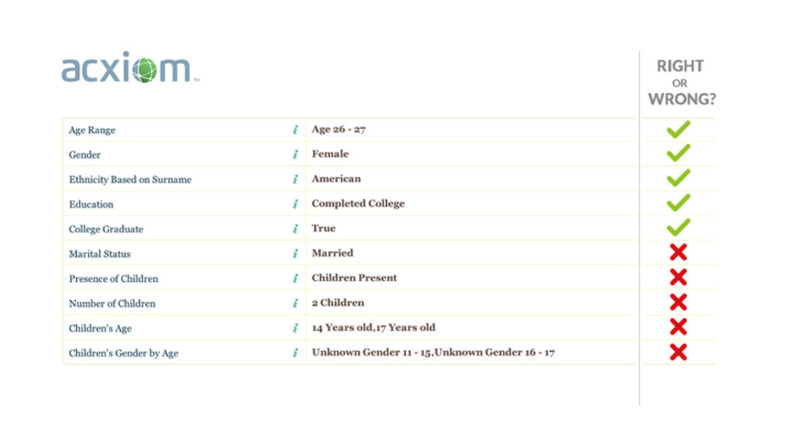 They gather data from public records, surveys, and online activity. Acxiom does admit up to 30 percent of a person’s profile information may be wrong at any given time due to it being based on a number of sources and potentially out of date. Acxiom offers a site where users can login and check the accuracy of their data and make corrections, the url is www.aboutthedata.com. I registered for an account and found they were about 75 percent accurate on what they collected. What was interesting were the categories, what was accurate and what wasn’t. Age, gender, ethnicity, education, marital status, number of children, veteran, household income was all very accurate. My home info was about 50/50 with year built, size, market value, loan info, purchase date, and equity. My vehicles listed were out of date and only referenced two of the five. Finally household interest data, such as activities, travel, sports, etc. were nearly spot on. I encourage you to login to Facebook and Axciom to see what has been collected on your profile, correcting any wrong information is up to you. 75 percent isn’t half bad in the data collection world. How does it make you feel if their accuracy was even higher? Positive that they’re getting it right, or frightened that there is such a great deal of data available about you? I honestly have to say it’s a conflict in my world. As you explored the type of data available by Axciom and Facebook and you thoguth about developing emerging media strategies, did you find that the great lengths and details were valuable? Cumbersome? Over-kill? These explorations take me back to evaluating research questionnaire devlopment and deciding if the data is a need-to-know, or nice-to-know area to explore. I would love to hear your thoughts on the extent of value by knowing so much detail as a marketer. So I was all ready to check out what Aboutthedata.com knows about me per your suggestion, but lo, it wants my email, a password, to stay in touch with me… I stopped right there. My fear of spreading even my email around is a a result of studying privacy concerns in this class and others, I suppose. This fear is real and justified. That’s all I need to know. By the way, were you able to correct the info about you the site had wrong?